I cook my own meal every day. Well almost. And cutting and cleaning flesh is part of the routine I perform every single day. Yesterday was seafood day (yaaayy~), so I took the squid out for defrosting before cleaning and cutting them. 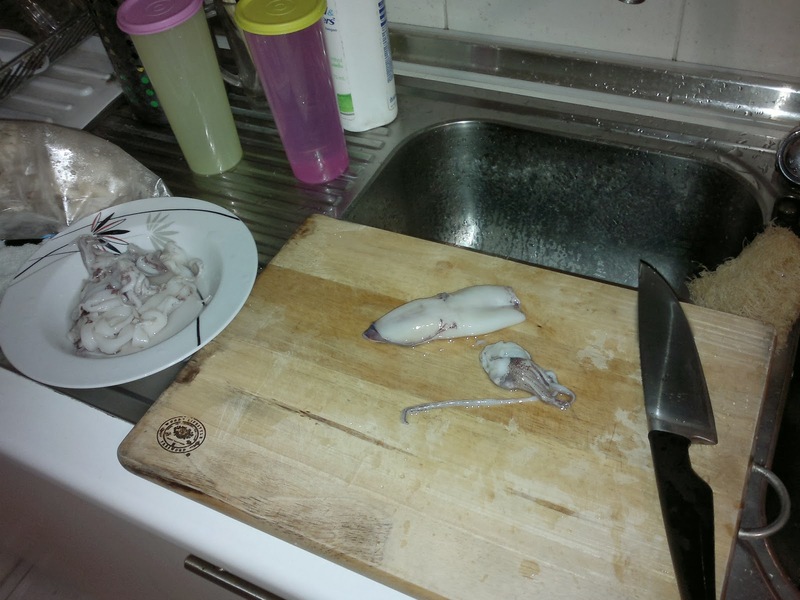 I took four animals and placed them on the cutting board, rinsed them with running water and began slicing them. Then I noticed something wrong with one of the squids; it has a huge, hard, bulging mantle. 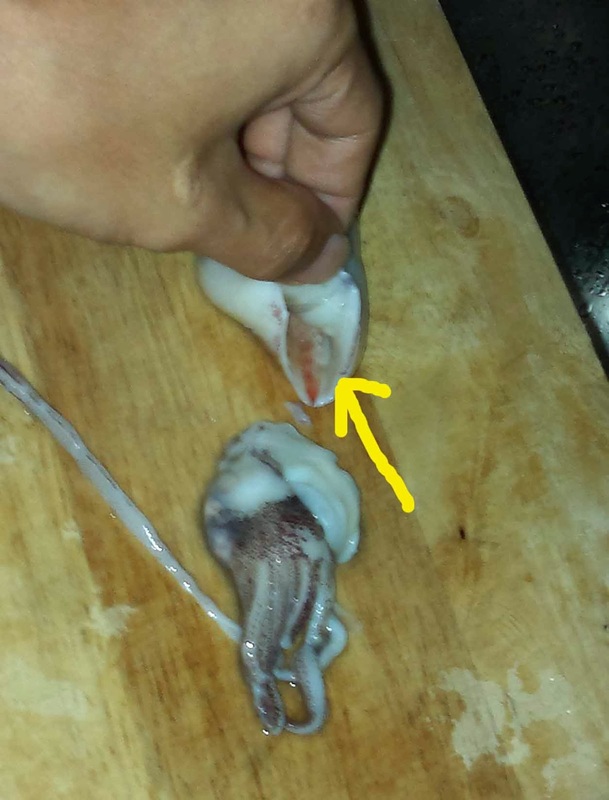 A squid's mantle is all that is visible behind the tentacles. It contains the digestive system and other internal organs. I pulled the head and the tentacles away from the mantle, and saw something fishy lying there: a fish tail. "Oh, it was the squid's final meal. Partially digested I guess." I thought. So I began cutting the mantle open. Slowly. 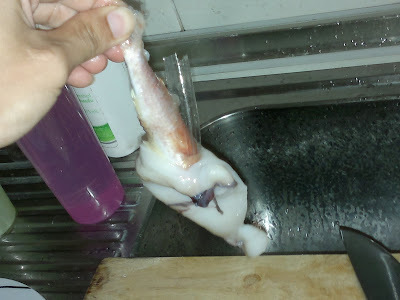 And I tried to pull the fish out but it stuck. At that point I began to understand that all the documentaries I've watched over the years were telling the truth; a predator will eat its prey with its scales/horn/spines facing backward (swallow the head first) so that the prey will only go further down the digestive tract, not the other way round. A viper, for instance, will eat its prey head first. A reticulated python will also eat a deer head first so that the antlers won't pierce through the snake's body. 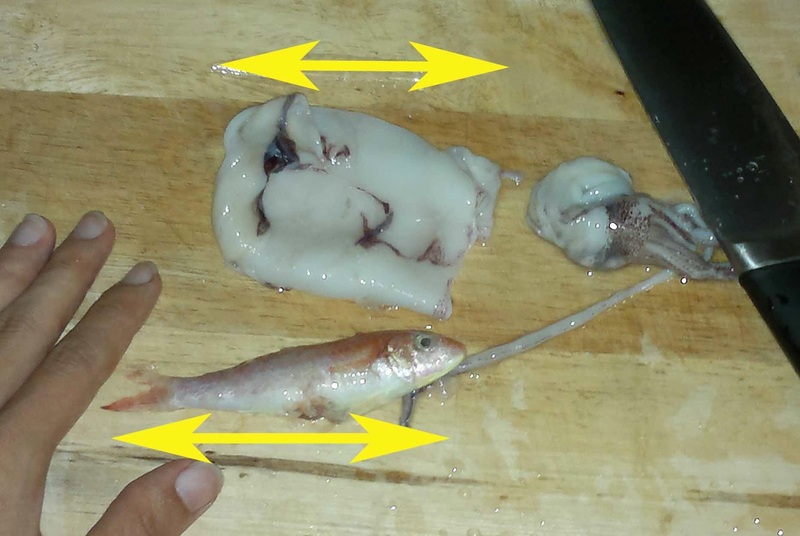 So in the squid's case, it ate the fish head first so that the scales wouldn't deter its passage in the squid's digestive system. But heck it was a hugeeee fish--it was slightly longer than the squid's mantle, which means that the squid was probably still swallowing the fish or had the fish's tail in its beak when captured. Needless to say, the cephalopod was a glutton with a voracious appetite, trying to swallow more than it can...er....swallow. 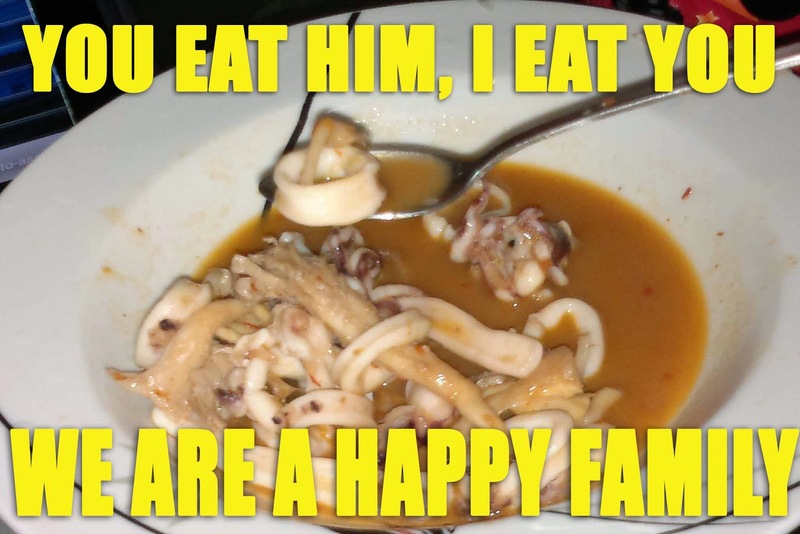 Because cephalopods don't chew. By the way this reminded me of an almost similar case a year ago, when I cut open an Indian Meckerel and found not one, but two tongue-eating louse inside its mouth. 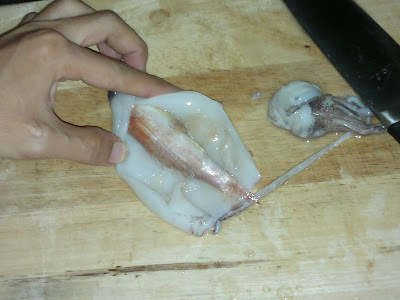 Unfortunately for the squid, I, too, am a predator with a voracious appetite for squid. A semi-foodchain in my kitchen.